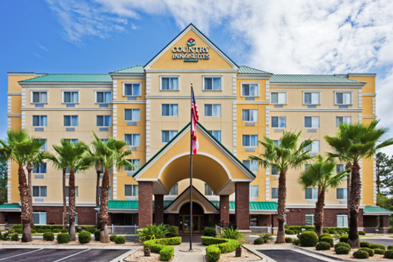 Experience Gainesville, FL Hotel's Comfort and Convenience. Enjoy perks like a well-equipped fitness center and the complimentary, hot Be Our Guest Breakfast buffet at the Country Inn & Suites By Carlson, Gainesville, FL. The hotel's convenient location just off I-75 is near the University of Florida, Kanapaha Botanical Gardens and the Florida Museum of Natural History, so you can save driving time while staying in affordable comfort. Business travelers appreciate free high-speed Internet access and a 24-hour business center, and leisure travelers can relax with the Read It & Return Lending LibrarySM and the heated indoor pool and whirlpool tub. With thoughtful offerings like laundry services, meeting facilities and spacious suite options, it's no wonder Gainesville guests love staying at the Country Inn & Suites.